For many of us, drug abuse seems like a problem that other people, other families, other communities struggle with. The reality is that drug abuse has become a serious health crisis throughout the nation, with overdoses and deaths on the rise, and our own community is no exception. On July 16, 2014, drugs brought heartbreak to the Poitra family, members of the Grand Forks Seventh-day Adventist Church, when 19-year-old Evan passed away at his home from a fentanyl overdose. Fentanyl is a powerful synthetic narcotic that is used in hospitals to control severe pain. Evan, a young man with a great sense of humor and someone who made people feel special, became part of an alarming trend of young people in the Grand Forks community who have lost their lives to drug overdose in the last two years. In the aftermath of this personal tragedy, Evan’s parents, Jackie and Wayne, are working to bring awareness to the epidemic of drug abuse that is destroying lives and leaving grieving loved ones in its wake. On April 24, 2016, they were interviewed by NBC Nightly News for a segment that aired the following day, highlighting the growing fentanyl crisis. The news clip can be viewed at http://nbcnews.to/1SYzTSf. The Poitras are also featured in a locally produced documentary, Faded, that depicts the real-life struggle drug addiction has wrought in the lives of four Grand Forks area residents. Faded will be shown at the Empire Arts Center in downtown Grand Forks as part of an educational forum: “Deadly Dose, The Realities of Fentanyl and Drug Overdose in Our Community.” The forum, sponsored by police and other local organizations, is May 10, 6:30-8pm, and is free and open to the public. This sobering and powerful documentary should not be missed. Experimenting with synthetic drugs like fentanyl is anything but “no big deal.” Highly addictive and dangerous, these drugs are so potent even one encounter can have devastating consequences. If you or someone you know is struggling with a drug addiction, please seek help now. There are people who care that are waiting to support you. Thirty-eight Grand Forks church volunteers gathered at the Public Works building with other local residents on Sunday morning, April 3, for a 2-hour shift in the Feed My Starving Children (FMSC) mobile pack event. 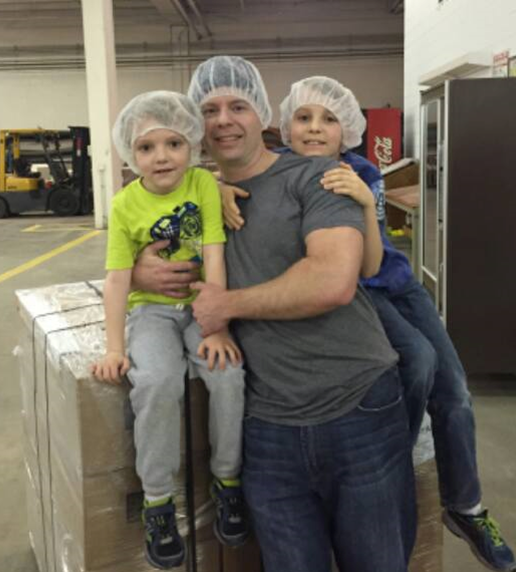 FMSC is a Christian non-profit organization working globally to feed children with meals packed by volunteers. 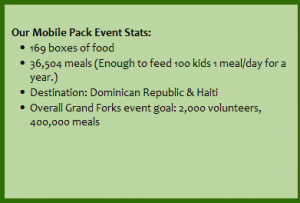 The greater Grand Forks area event ran April 1-3, drawing participants from churches, businesses, and other groups. Funds to cover the cost of the meals packed were also raised locally. The day began with learning how to pack the meals and hearing “Emmanuel’s Story.” “Emma,” a toddler in Africa, is one of the many children whose lives have literally been saved by this incredible ministry. When a local ministry was connected with Emma and his three siblings, 2.5-year-old Emma weighed 9 pounds and couldn’t walk. (As a mother of an almost 2-year-old, this broke my heart.) Thanks to meals from FMSC, these children are now healthy and have a new joy for life. Next, we donned on some very fashionable hairnets and got down to business. We divided into teams and settled into specific roles (everything from rice scooper to supply re-filler to bag weigher and more), working efficiently and grooving to a background of peppy tunes. 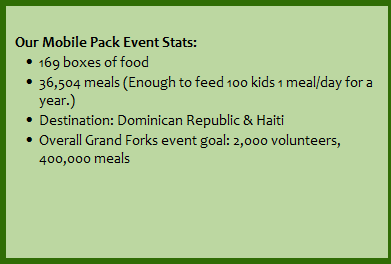 Our group assembled MannaPack Rice, one of three meal packs specially developed by FMSC to not only meet the needs of severely malnourished and starving children but also maintain the health of children no longer in extreme hunger. This mixture of rice, soy, vitamins, and dehydrated vegetables can be prepared with only boiling water. Each meal costs less than 25 cents to produce. The morning concluded with praying over the pallet of food we had packed, asking that God would guide it safely to its destination and bless the children who would eat it. We also got to sample the MannaPack Rice. (It was actually pretty tasty!) This event was well-worth participating in—both in the chance to be the hands of Jesus feeding hungry children and in the blessing of fun and fellowship. To learn more about Feed My Starving Children and watch the stories of the children impacted by this ministry, visit www.fmsc.org. Our world is a tough world for kids. They are surrounded by so many forms of darkness that even 20-30 years ago were not an issue for children. Our church has an opportunity to plant a seed of hope in the lives of our church’s children and reach out to children of our community. 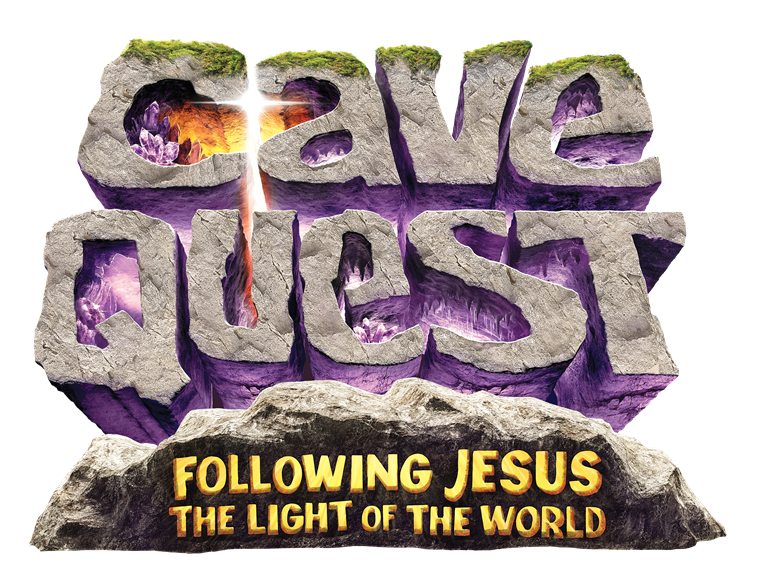 This year’s Vacation Bible School (VBS) will be the evenings of June 27-30, and the theme is Cave Quest – Following Jesus the Light of the World. VBS gives us the tools to introduce Jesus to children, to teach that Jesus loves them, Jesus can help them, and Jesus is always with them. The Group Publishing VBS program is an excellent, well-put-together program, with modern, catchy music that kids love, a Bible Spotlight featuring a Bible story, and a Bible Buddy animal that teaches kids the wonders of God’s creation. Our church has used Group programs for over ten years and has witnessed to hundreds of kids during that time. Many years we have had 50-60 kids participate in VBS, with the majority from our community. We cannot do VBS without volunteers from our church. 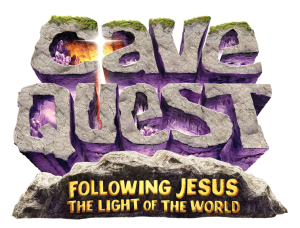 Team leaders, station leaders, decorators, and technology experts are needed to bring this program to kids who need the light of Jesus. If you are interested in helping with VBS, please see Leanne Erickson! The kits were divided equally between children and adults, males and females, and contained such items as blankets, socks, Kleenex, hand sanitizer, lotion, activity books, candy, a Dairy Queen gift card, and a copy of Pastor Mike’s sermon on finding peace. 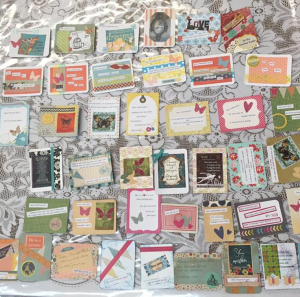 The children’s kits also included a stuffed animal and a children’s Bible, while the adults were supplied with a copy of “Steps to Christ.” Each kit was topped off with a handmade card, in which was written a message of support and a promise to remember its recipient in prayer. Members of the Junior class were able to earn their Community Services honor for Pathfinders. It is our prayer that these twenty individuals and their families feel the love of Jesus surrounding them during their difficult journeys, and that you are richly blessed for your generous support of this project. Our Women’s Ministries event for all Brave Girls was held on Sunday, April 3, at the church. 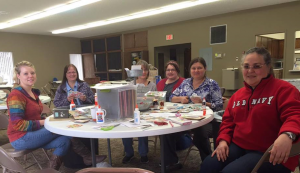 After a quick devotional by Jen Erickson about being freed from the bounds of slavery to sin, we settled in for a craft project with a purpose. 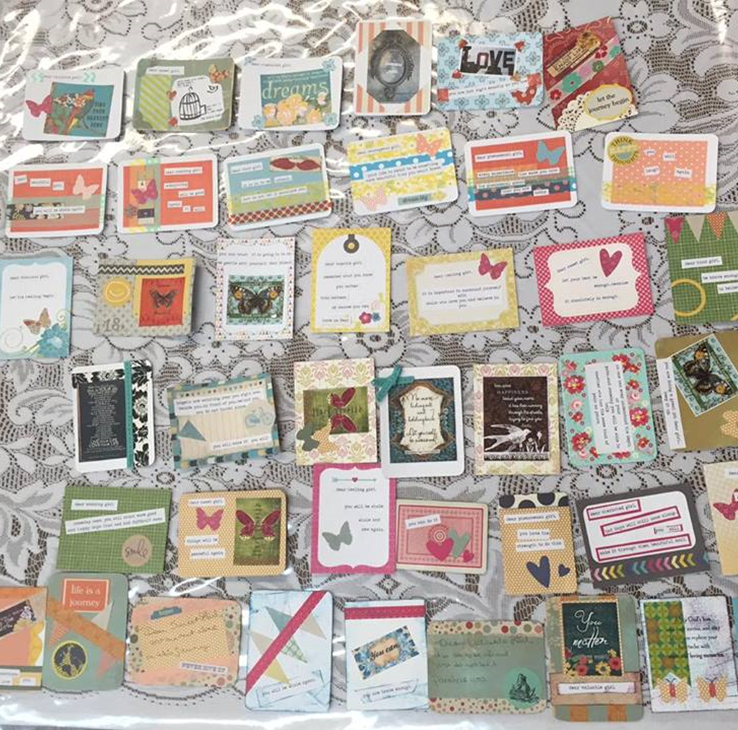 These cards were gathered and will be sent off to an organization that distributes them to girls caught in the human trafficking industry overseas. These girls are often not allowed any personal possessions, and the hope is that they could have this small card to give them bravery until they can escape to a better life. If you would like to submit information for the church newsletter, email gf-sda-pray@live.com.